Almonds are a delicious nut that are packed with minerals, vitamins, healthy fats, and antioxidants. Almonds come from the Mediterranean, the Middle East, and the Western United States and are very good for you because they are a very nutritious snack. Consuming almonds can help you lose weight, improve your cardiovascular health, and keep your digestion working well. You can eat almonds with the skin on, blanched (skinless), and roasted. It is usually best to eat almonds without removing the skin because the brown almond skin is full of antioxidants. That means that some of the other health benefits of eating raw almonds include improving the symptoms of diabetes, boosting your immunity, and they have anticancer properties. In this article, you will find out about the rich nutritional content of almonds and why they are so good for you. You will also learn about recent scientific research that shows why almonds are a delicious healthy nut. Almonds are actually not true tree nuts – they are the seeds of the fruit of the almond tree (called drupe). Almond seeds are surrounded by a hard shell which has to be removed to enjoy the tasty almonds. You can eat raw almonds with the skins still on. However, many people prefer blanching almonds by placing them in some boiling water to help remove their skin. This gives skinless almonds a finer texture that is good for making almond flour. Almonds, like many other nuts and seeds, contain phytic acid which can inhibit the absorption of important nutrients. One way to remove the phytic acid is to soak the nuts overnight. This means that soaked almonds may have better nutritional content than unsoaked almonds. As well as eating roasted or raw almonds as a tasty nutritious snack, you can also consume almond milk, almond butter, or almond paste. The reason why almonds are very healthy is that they contain fiber, protein, healthy fats, and important minerals. Scientists also say that almonds can help with weight loss. Even though almonds are an energy-dense food, there is no evidence that consuming almonds daily increases weight. Almonds are so good for your health because they are packed with vitamins and nutrients. Half a cup of almonds has 5.3 mg of iron which is 30% of your daily iron needs. The nutritional health benefits of almonds are also due to the fact that they have high levels of antioxidants. Let’s look in some more detail at why almonds are so good for you, including why dry roasted almonds are good for you. Eating almonds every day is good for weight loss as they increase satiety and give you plenty of nutrients. Learn about other tried and tested methods to help shed extra pounds and maintain a healthy weight. Almonds are a low-carb food that can help control blood glucose levels and lower cholesterol in diabetics. Find out what other foods can help to control type 2 diabetes and the benefits of adding okra to your diet to help manage diabetes. Because almonds contain unsaturated fats as well as many other nutrients, a daily serving of almonds can keep your heart in good health. Let’s look at some specific reasons why almonds are so good for your heart. Raw almonds with their skins contain nutrients, minerals, and unsaturated fatty acids that protect your heart because they help reduce cholesterol. Almonds are just one of the many foods to eat that help reduce cholesterol. Minerals in almonds such as magnesium and potassium have a positive effect on blood pressure and help improve cardiac health. Learn about other natural methods to keep blood pressure at a healthy level. Snacking on almonds every day may help to boost your memory and prevent certain cognitive-related diseases. Learn about some of the best herbs that help to boost brain function and protect against cognitive dysfunction like Alzheimer’s disease. One of the benefits of raw almond consumption is that they can help boost your digestion. Consuming raw almonds with their skins intact can help to give your immunity a great boost and help prevent infections. Learn more about natural ways to stimulate your immune system to help keep yourself healthy and free of infections. The high levels of antioxidants in almonds help to reduce inflammatory responses in your body. Learn what other foods have a natural anti-inflammatory effect that can lower your risk of developing chronic diseases. The health benefits of almonds also protect the health of your liver. One randomized controlled clinical trial involving 100 women examined how consuming almonds can help lose weight. The women were divided into 2 groups and consumed the same low-calorie diet. 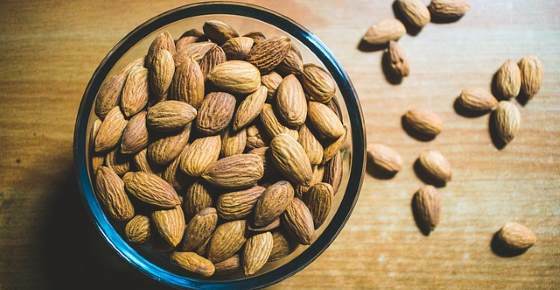 One group supplemented their diet with 50 grams of almonds a day. At the end of the trial, the group consuming almonds lost more weight than the other group. Find out some of the other healthy foods you should consume to help keep your liver in good health. Almonds are extremely good for your health because of the number of nutrients and antioxidants they contain. Nutrient-dense almonds also have properties that help protect against certain types of cancer. Of course, more research needs to be carried out to discover how nuts such as almonds may help reduce the risk of developing cancer. Find out what other foods you should add to your diet to help protect against cancer development. After learning about the many reasons why consuming almonds is beneficial for your health, you may be wondering how many almonds should you eat every day. Many studies have shown that consuming 1 or 2 servings of almonds a day help to improve your cardiovascular health, reduce diabetes symptoms, and boost your immunity. One serving of almonds is equivalent to 1 oz. or 28 grams of these tasty nuts. There are about 23 whole almonds in one-serving portion. It is good to remember that, although almonds are classed as an energy-dense food, the type of fat in almonds is very good for you. As some studies in this article have pointed out, there is little risk of weight gain when adding 1 or 2 daily servings of almonds to your diet. You can greatly increase the health benefits of almonds by soaking them before consuming them as a tasty and healthy snack. There are many health benefits of soaked almonds because most nuts and seeds have anti-nutrients like phytic acid. This compound can make all the previously discussed important nutrients less bioavailable when you consume them. These nutritional inhibitors can be minimized or eliminated by soaking. If you plan on consuming seeds or nuts on a regular basis, it would be wise to soak them in water for 7-24 hours to remove the phytic acid. Carry an ounce of pre-soaked almonds with their skins still on and snack throughout the day whenever you feel hungry. Add blanched almonds to salads or desserts to improve their nutritional content. Put a handful of soaked almonds in your favorite smoothies to help give your health a boost. Replace regular flour with low-carb almond flour when baking. Switch to calcium-enriched almond nut milk instead of dairy milk. For most people, almonds are a delicious snack that have many health benefits. Dry roasted almonds, raw almonds, and blanched almonds are all good to consume. Walnuts: Help prevent heart disease, lowering LDL and are rich in antioxidants. Read more about them in my article “Here’s What 7 Walnuts a Day Can Do For Your Health“. Brazil nuts: Contain high amount of selenium which may reduce the risk of developing certain types of cancer. Brazil nuts also have strong antioxidant properties, reduce inflammation and improve heart health. Read more about them in my article “Brazil Nuts: Proven Benefits, How Many to Eat Per Day, Nutrition, Calories“.